Early each spring, when I begin cleaning up and weeding our garden beds, I tell myself that as soon as the sodden clay soil in the perennial bed dries out just a bit, I should dig up most of the Lady’s Mantle. For despite its genteel name, in our garden this muscular plant is highly invasive. Its roots take hold with superglue strength, its foliage spreads like wildfire, and it readily self-sows if its flower heads aren’t cut off quickly. No matter how hard I’ve tried to keep it in check, Lady’s Mantle has had the nasty habit of crowding out other, more delicate flower species that I’d hoped would flourish. But then it rains – and I can’t help but notice the sheer beauty that emerges when water droplets shine like strings of pearls along the edges of the Lady Mantle’s water-repellent leaves. Apparently I’m not the only one who has appreciated this: according to Wikipedia, alchemists used these beads of water, which they considered to be totally pure, in their efforts to turn base metals into gold (thus giving rise to the plant’s Latin name, Alchemilla mollis). It rained the other night. So once again, the Lady’s Mantle has won a reprieve. 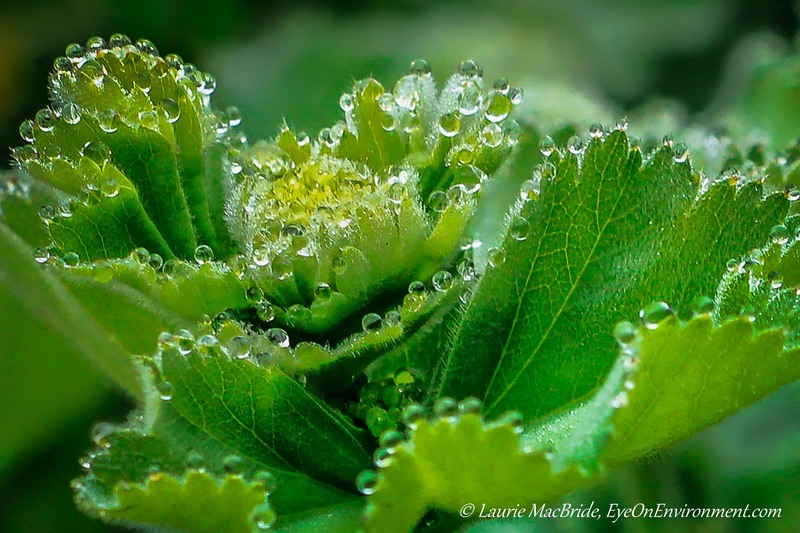 Posted by Laurie MacBride, Eye on Environment on April 6, 2016 in Garden and tagged beauty, closeup, gardening, nature, photos, plants, rain, spring, viewpoint. Great blog…as ever. Your photography is a standard of excellence. Thanks so much, Fred – too kind! I’m a big fan of your blog and photos too. Really, really beautiful, Laurie, what a delightful image with some great writing to really frame it! I love this! Thanks so much, Toad! I really appreciate your comment. There’s another (different) image of a lady’s mantle with raindrops in the preceding post if you’re interested. I never knew there was a connection between alchemy and water droplets on Lady’s Mantle. Awesome post and photo. May I repost the link with attribution? Thanks Jennifer, and yes, you may – please scroll down to the bottom of the left side of the webpage to see my copyright and permissions policy. Thanks for visiting my site! Well said! Thanks for your kind words, Robin – glad you like the image. What an amazing photograph too – translucent pearls. Thanks, Kim! Yes, those pearls really do come to the rescue of this plant each spring. Guess I’ll be madly deadheading flower stalks once again in a few months….